The White House and NASA on Tuesdaydefended comments thatthe nation's top space official made on the Arabic news networkAl-Jazeeraabout one of his "foremost" tasks being to reach out to the Muslimworld. 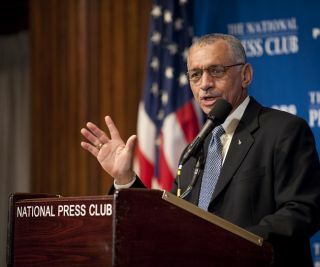 NASA chief CharlesBolden's remarks caused a stir among commentators. "When I became the NASAadministrator, (President Obama) charged me with threethings," Boldensaid in the interview which aired last week. "One, he wanted me to helpre-inspire children to want to get into science and math; he wanted metoexpand our international relationships; and third, and perhapsforemost, hewanted me to find a way to reach out to the Muslim world and engagemuch morewith dominantly Muslim nations to help them feel good about theirhistoriccontribution to science, math and engineering." On Fox News Channel, commentatorCharles Krauthammer called Bolden'scomments "a new height of fatuousness. NASA was establishedto getAmerica into space and to keep us there. This idea of 'to feel goodabout yourpast scientific achievements' is the worst kind of group therapy,psycho-babble, imperial condescension and adolescent diplomacy. If Ididn'tknow that Obama had told him this, I'd demand the firing of CharlesBolden." White House spokeswoman Moira Macksaid the president'sintention is collaboration. "The president has always said thathe wants NASA to engagewith the world's best scientists and engineers as we work together topush theboundaries of exploration," Mack wrote in an e-mail.